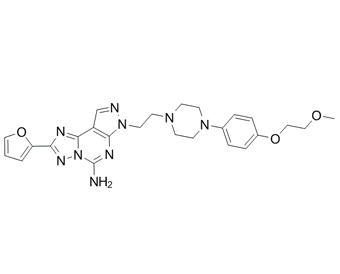 Preladenant, also known as SCH 420814, is a potent and selective antagonist at the adenosine A2A receptor, which was being researched as a potential treatment for Parkinson's disease. Positive results were reported in Phase II clinical trials in humans, but it did not prove itself to be more effective than a placebo during Phase III trials, and so was discontinued in May 2013.
. Hodgson RA, et al. Preladenant, a selective A(2A) receptor antagonist, is active in primate models of movement disorders. Exp Neurol. 2010 Oct;225(2):384-90.